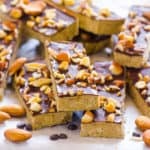 The best homemade protein bars I ever made. These are to die for! Delicious, moist and extremely crunchy inside and outside. Even if you skip the topping, protein bars are crunchy. Although that means missing out on toasted almonds and chocolate. I made protein bars high fat instead of high in carbs and sugar on purpose. I’d rather eat healthy fats than sugar. And that’s my main problem with all commercial protein bars, not to mention a horrible list of ingredients. I played around with the recipe 5 times: no chocolate, without almonds, with chocolate chips, even using chocolate and berry protein powders. 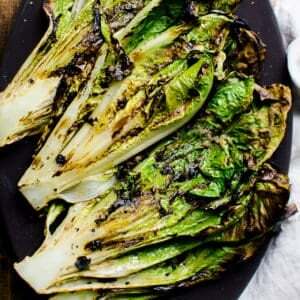 Every time they came out amazing – foolproof recipe. And the best part is the bars are ridiculously easy to make – 10 minutes, 6 ingredients and no baking. They are vegan, gluten free and dairy free. I was shocked at the nutritional info. 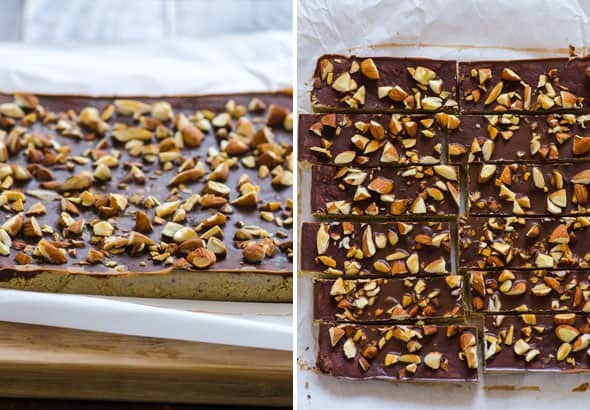 These homemade protein bars look so bad for you, you know what I mean?! And at same time each bar contains only 0.5 tbsp coconut oil and peanut butter each, 0.5 tsp chocolate chips, 2.5 g sugar and 5.8 g carbs. Loaded with heaping 2 tbsp of protein powder and almonds, each bars delivers 9 g protein and 14 g fat. I recently found my favourite plant based protein powder – Vega Sport. I like the fact I can mix it with water and it tastes delicious. I used Vega vanilla, chocolate and berry to make these bars, as well as Sunwarrior protein powder. I do not recommend using plain pea or hemp protein powder in this recipe. Check out my full list of clean protein powders I like the taste, ingredients’ list and price of. 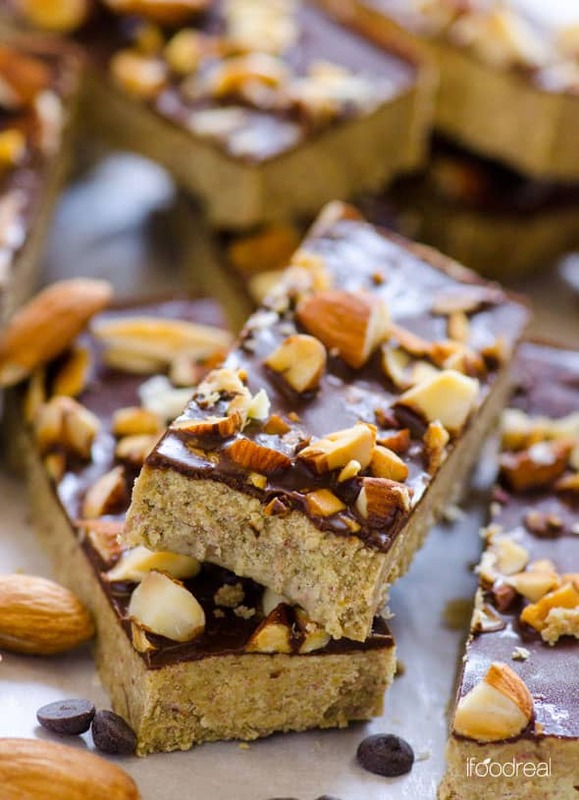 Homemade protein bars take 10 minutes, 6 ingredients and no baking. 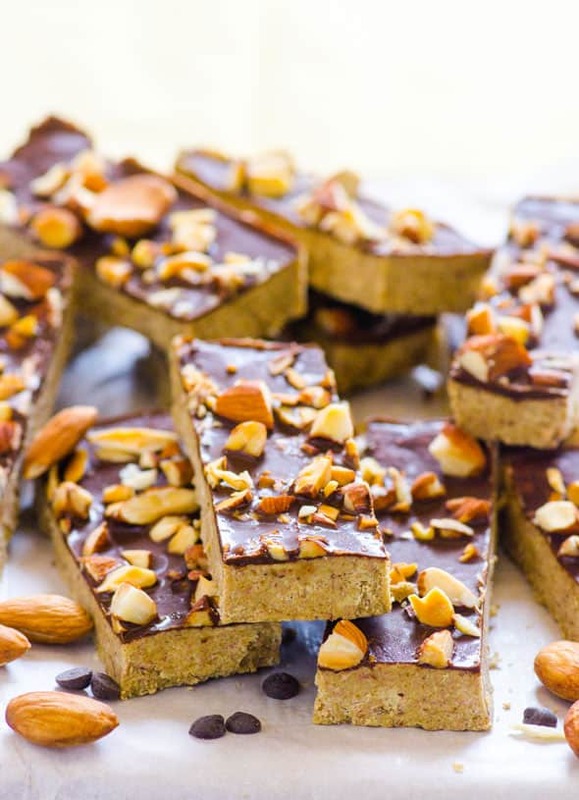 Delicious crunchy protein bars recipe. Only 2 g of sugar, 5 g of carbs, vegan and gluten free. Combine coconut oil, peanut butter and milk in a medium bowl. Microwave in 30 seconds intervals until melted, stirring in between. Then whisk to combine well. Add protein powder + almond meal and mix with a spatula until combined. It will take a few minutes. Dough will be crumbly, that’s fine. Line 8″ x 8″ baking dish with unbleached parchment paper and fill with prepared dough. Flatten with your hands and then level with spatula, pressing dough into the dish all the time. Combine chocolate chips and 1 tbsp coconut oil in a small bowl. Microwave for 30 seconds or until melted, then stir well. Pour over the bars and tilt the dish until all bars are coated evenly with chocolate. Toast almonds in a small skillet on low-medium heat until lightly brown, about 5 minutes. Stir frequently and watch closely not to burn. Sprinkle on top of chocolate. Freeze for 20 minutes or refrigerate for 1 hour. Remove from the dish by holding onto the flaps of parchment paper and place on a cutting board. Cut into 12 bars and enjoy chilled. Store: Refrigerate in an airtight container for up to 1 week. Freeze: Freeze in an airtight container for up to 3 months. Thaw at room temperature for 20 minutes. *I tried Vega Sport protein powder in vanilla, chocolate and berry flavours, as well as Sunwarrior protein powder). I do not recommend using plain pea, hemp or whey protein powder in this recipe for taste and texture reasons. **You can skip the topping but nutritional info won’t change much.